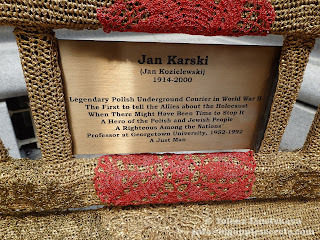 Jan Karski was a Polish World War II resistance movement fighter and later a university professor in Georgetown university. You can find more about Karski in my previous post. A statue honoring his memory was unveiled in Georgetown university, Washington D.C. in 2002. 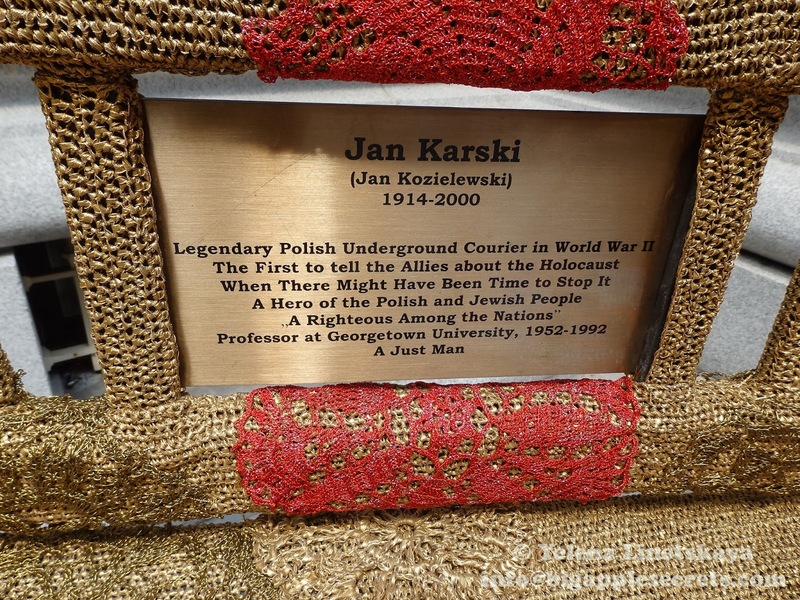 In New York the copy of the same statue was unveiled in 2007 in front of the Polish Consulate in Manhattan. You can read about Polish Consulate, former Joseph Raphael De Lamar House in my blog. This summer Polish artist Olek crocheted the Jan Karski statue at the Polish Consulate in New York. The project was intended to honor the memory of the Polish hero on the fifteenth anniversary of his death. 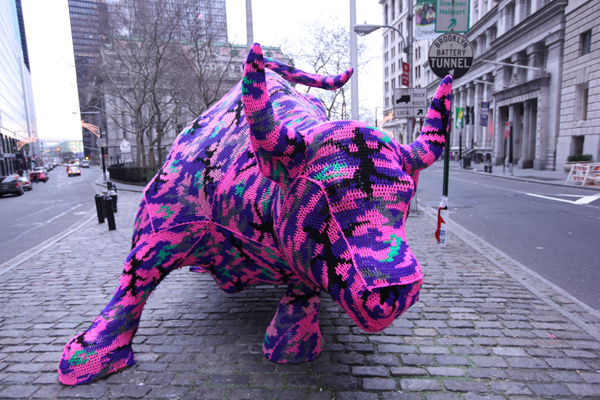 Olek is known for dressing the iconic Charging Bull of Wall Street and ‘yarn bombing’ everything from the Cube in Astor Place to a locomotive in Łódź to a minotaur in Switzerland. 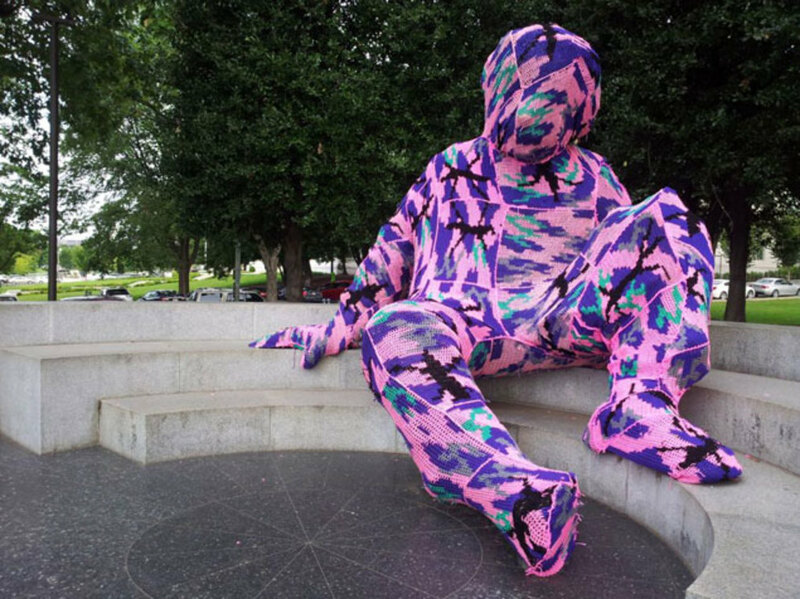 In July 2012 Olek covered the National Academy of Science’s Albert Einstein Memorial (Washington D.C.) in pink and purple crocheted fabric. Olek says that Einstein, for her, was an easy choice since he was such a creative thinker himself. “I thought he might have a sense of humor about it,” she says. DC didn’t—Olek’s work was removed within hours. 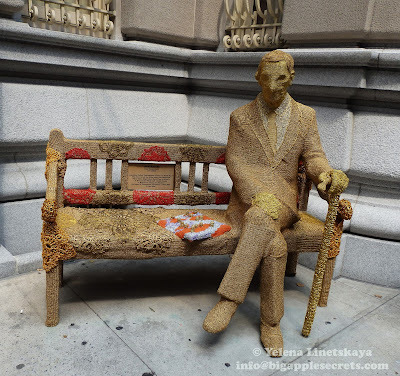 At this point, Olek has assistants in New York and Poland whom she has trained and who help her “with crocheting different patterns” for her monumental works, most recently: the large traditional Hawaiian canoe, the women’s shelter in New Delhi (for which she also hired local women), and the Jan Karski statue and bench in front of the Polish General Consulate in New York. 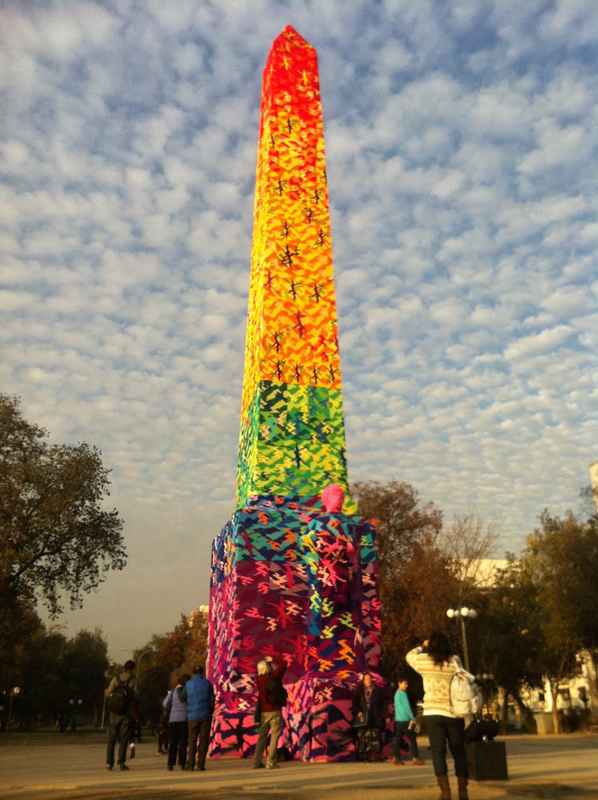 Earlier this year during the Festival in Santiago, Chile, Olek covered obelisk at the center of Plaza Baquedano in a rainbow colored crocheted design to highlight the issue of equality. This year she’s going to begin “a huge public project, involving the community and talking about environmental issues and recycling” with the Virginia Museum of Contemporary Art.